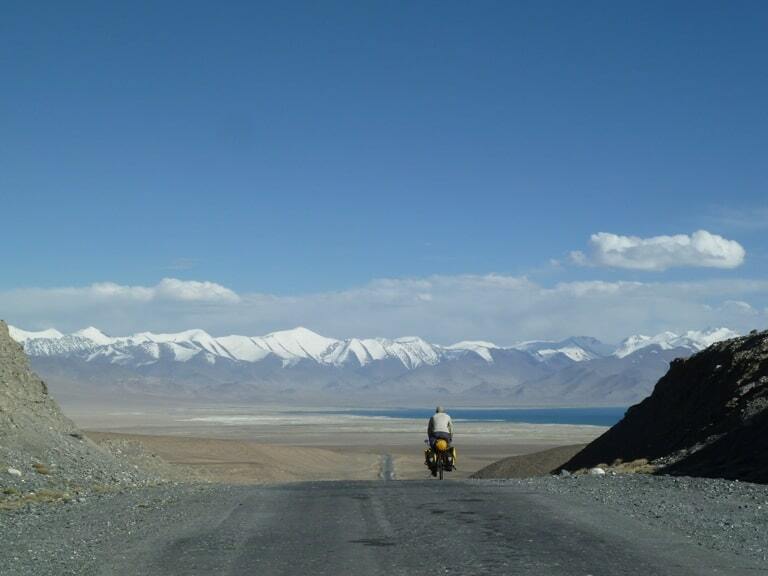 Tajikistan cycling tour The Roof of The World, Pamir and Wakhan trip is an epic, high altitude cycle ride through spectacular remote mountains in two of the least visited countries in the world. At the cutting edge of adventure cycling, this journey offers a fascinating insight into ex-Soviet Central Asia. Day 1– Arrival to Dushanbe. Meeting at the Dushanbe airport and transfer to hotel. We set off east towards the Pamirs to cover before we reach our destination of Kalaikhumb. Although have another long day on the road, we are quickly distracted by the beautiful scenery and interesting villages en route. This area is a little more conservative, and we see many men with beards, and women wearing traditional dress. We cross the Shurabod Pass (2200 metres), arriving in Kalaikhumb in the early evening. Lunch on the way. Dinner and overnight at the Guest House. From Kalaikhumb we leave to Khorog along river Pianj, border of Afghanistan. The people of Badakhshani are — not Tajiks, but a number of separate tribal groups. They have their own languages and their religion is not Sunni Islam but the Ismailism of the Agha Khan, Ismaili attitudes and dress are much more liberal than the Sunni neighbors just over the pass. We stay in relative luxury tonight, having reached the capital of the Gorno-Badakshan Autonomous Oblast (GBAO. After the shopping foods and all equipments for bike, bicycles with lugagge will transported to Khorog with Bus track. Accommodation: at the Hotel Lal. After breakfast at the home stay, starting first days cycling along the Gunt river by asphalt road and beautiful villages. People are very friendly. Our car and guide will follow you. Short snack on the way. Arrival to Wer village. Camping. After breakfast cycling to Jelondy, is a small village. Car will follow you. Lunch/snack on the way. Arrival to Jelondy. Visit Jelondy sanatorium with it is hot spring. Camping near sanatorium or if there is some spare rooms then overnight at the sanatorium. After breakfast we continue cycling trip to Bulung Kul village via the Khargushi Pass (4333m) by accompanying our guide and driver. On this journey we leave behind the lush valley of the Shugnan Valley and enter a landscape that is rocky, mort barren, but nevertheless dramatic. Here the road combining with asphalt and gravel till Bulung Kul village. Bulung Kul is a small village situated near Bulung Kul Lake. All inhabitants of Bulung Kul village are Pamiri people. Picnic/snack on the way. Short walking around Bulung Kul Lake. Accommodation: Tent camping near the lake. Breakfast at the home stay and starting cycling towards Wakhan corridor. From here road also combining with gravel and asphalt. We cross Chokur Kul Lake. Cycling through Khargush Pass 4344m altitude. Short snack on the way. In Khargush there is check point – military border guides. Check point formalities. Arrival to Khargush. There is several Pamiri shepherds houses, camping, a little bit far from small village. After breakfast at the camp cycling towards Langar along the high mountains, along Pamir river and Afgan border. On the next side of river you can see Afgan shepherds houses, also shepherds going from one neighbor to another by horse, by donkey, by camel, on foot. Short snack on the way, arrival to Langar. Dinner and overnight at the home stay. Accommodation: at the local home stay, with shower. After breakfast at the home stay cycling towards Yamchung on the way visit Suffi Muborak Kadam museum, Stone Solar calendar in Yamg, visit Yamchung Fortress, Bibi Fotima hot spring. Picnic somewhere on the way, cycling to Ptup village 4km from Yamchun for overnight at the home stay. Dinner at the home stay. After breakfast cycling towards to Ishakshim. Visit Avg sanatorium famous with healing power in the Avg village. Visit on the way some shrines, museums, Qakha Fort in Namadgut village. Short picnic on the way. This impressive structure rises from a naturally formed platform of rock and dates back to the Kushan era of the 3rd Century. Please note that the fort is sometimes still used by local Tajik military forces so the excursion will be dependent on permission from the local authorities. If we are able to visit whilst the military are in place, please be extremely careful about taking photographs only with permission. Arrival Ishkashim center. Ishkashim itself may be the regional centre, but it is essentially still a large village. There is little to see or do in Ishkashim itself. Picnic on the way/Dinner and overnight at the guest house in Ishkashim. After breakfast cycling towards Garm Chashma. We pass regional gem mines mentioned by Marco Polo in his descriptions of what he called the ‘Mt Shugnon region’. The most famous mine is Koh-i-Lal ruby mine which is visible from the road. Hot mineral spring Garm-Chashma (in Tajik «Hot Spring») is situated at an altitude of 2325m above sea level, on the western slope Shahdara ridge in the middle reaches of the river Garm-Chashma, in Ishkashim region of Gorno-Badahschan Autonomous Region of Tajikistan. In the travertine hill there are a number of natural basins — basins of different sizes, with a water mirror from 0,5 to 20 square meters. m and a depth of half meter. They are filled with hot water turquoise, which includes iron, aluminum, magnesium, strontium, fluorine and other elements. The water also contains a large amount of hydrogen sulfide (170 milligrams per liter), silicic acid (135 milligrams per liter), and carbonic acid (381 milligrams per liter). The water temperature at the outlet of the griffins on the surface of about plus 62 degrees Celsius. Water temperature in the «pool» ranges from plus 38 to plus 50 degrees Celsius, depending on the proximity of the source. Outside walls reservoir produce charming impression, thanks to them prioresses white stalactites, painted in a variety of colors covering their colorful algae. Bottom of the biggest «pool» is covered by sediments of thin, soft sediment of calcium carbonate mixed with sulfur. Lunch/snack on the way/Dinner and overnight at the home stay in Garm Chashma. Breakfast at the home stay in Garm Chashma, after cycling to Khorog. Last days cycling. Picnic on the way. Arrival to Khorog. Accommodation at the Hotel Lal. After breakfast at the home stay load bicycles and luggage’s onto Bus track. After 8 days hard cycling we drive back towards capital of Tajikistan. Today our destination is Kalaihumb. We drive along Pianj river/Afgan border. Lunch on the way. Dinner and overnight at the Guest House in Kalaihumb. Breakfast at the guest house, continue our last day’s journey to Dushanbe. Transportation for Bicycles from Dushanbe to Khorog and back way. Important – early arrival is not included. • Some sightseeing places and excavations might be closed / not possible to visit due to local changes, reconstruction, roads condition, and security reasons. We do not guarantee all advised places will be covered, but we will try to do our best to cover them. Tajikistan: GBAO, Murghab Murghab 70-Soolagi 34.